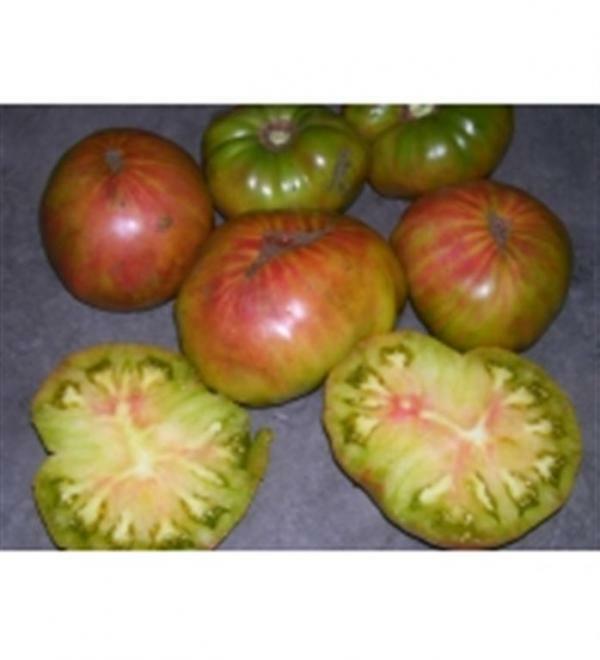 This spectacular French heirloom tomato produces big, sprawling, leafy plants that yield A heavy crop of 1 to 1 1/2 lb., round, dark-purple, fruit with green shoulders. Interior color is a tie-dye like mix of pink, red, green yellow colors. Loaded with an abundance of rich and delicious, full-bodied, sweet & smokey flavors with a good amount of acidity. A great new addition to the list of splendid black tomatoes. Try this tomato in a salad with other colors. Makes a delicious rich tomato sauce. Slice across the "equator" for a real feast for the eyes as well as the tastebuds.